What will it take for a Fourth Street turnaround? The Roxy: in the middle of it. The new idea for a “residential oasis” on Fourth Street is intriguing. It rests on a simple notion: If several commercial buildings have fallen stagnant on the street block, between Pacific and Washington avenues, then why not try a residential approach? Bremerton Architect Steve Rice’s idea for residential lofts, which compliment the 22-year-old flowering pear trees on the one-way boulevard, already has some traction in that the City Council had been seeking an idea for economic development downtown to which to reallocate federal dollars. Fourth Street’s alter ego, between Park and Pacific, is bustling with street life, making the older section contrast all the more. So what will it take to complete the turnaround? Here’s the four main ideas I’ve heard floated. Not that they are not mutually exclusive, that is, they could occur in some combination. Residential Oasis: The newest candidate is still early in its concept. But the basic idea would be to help property owners convert spaces — likely lofts — to quirky residential units. Federal dollars could be spent to provide loans for upgrades on buildings that require big code improvements — seismic upgrades, fire sprinklers and the like. Cost: Possibly little to the city (federal dollars from HUD could help) though property owners would have to step up. The payoff: More people living downtown, which means more vibrancy, more money spent, taxes paid and more lights on in the darkened corridor. Take out the trees: This was the original idea, put forth by the property owners and Bremerton Public Works Director Chal Martin. Property managers on the street have maintained that the trees’ canopy and leaves leave it dark and give it a spooky feel that few retailers are willing to brave. Adding lighting could help brighten the street, too. Cost: Taking down the trees would be paid for by the city or the property owners (or some combination). The payoff: We would find out if owners and managers there are right — that the street would become far more marketable to commercial businesses looking to relocate. But fans of the trees have countered that the buildings themselves, whose facades have aged, might still not be that attractive. Further, the city also must at some point mitigate the risk of having the sidewalk buckle from the trees and someone getting injured. Make it a two-way street: The meandering bend to Fourth, installed as part of the 1993 improvement project, even has the added negative effect of making sure motorists are watching the street rather than getting a chance to look around the storefronts. Plus, in only going one way, you’re losing a lot of chances for drivers to see it, a turnoff for potential retailers. Cost: Doing that kind of concrete work won’t come cheap. The payoff: More motorists and parking that might pique retailers’ interest, leading to more tenants, profits, tax money, ect. Pedestrian plaza: The most obscure idea for the street is just to shut it down completely to traffic, leaving a short stretch for people to get to the hotel near Washington Avenue. A pedestrian plaza could be used for outdoor concerts and public events and might just achieve “that resort feeling” former Mayor Louis Mentor was going for in 1993. Cost: Reconfiguring the city block will also not come cheap. The payoff: Festivals and other big events might come to downtown Bremerton. But the buildings on the street would still face the same problem: that motorists won’t see what it has to offer. In fact, they wouldn’t see it at all. Which option is your favorite? Or do you have another idea? I think eventually the pedestrian mall will be the best use, Josh. Spending more now to ‘improve’ that area by cutting down trees and making more parking will take away the charm of this unique street. I am really glad we were able to save the trees. This is one of the prettiest streets in our downtown area. It is not scary and some of the buildings that are empty now were empty before they ever put in the trees and made it a one way street. A redesign of the street could take place if that is what a developer(s) wanted to do. Otherwise most of these building will probably stay empty because of the stringent code requirements. It would be difficult for a small business to come into one of these building if they had to do all the upgrades before they could open. If the owners want to sell these buildings they need to be the ones to do the upgrades so they can make them usable and sell them. I am really glad this subject has come up again and hopefully someone will jump on this. I think the wonderful folks at the Roxy Revival are on the right track to getting this street moving in the right direction. Also I am happy to see that Wobbly Hops is taking over one of the empty spaces and creating more reasons for us to go up that lovely street. Thanks to the tree committee for helping stop the travesty of cutting these trees down at least until there is a plan on what to do next. Love the idea of work/lofts. I think the trees are charming and against removal. 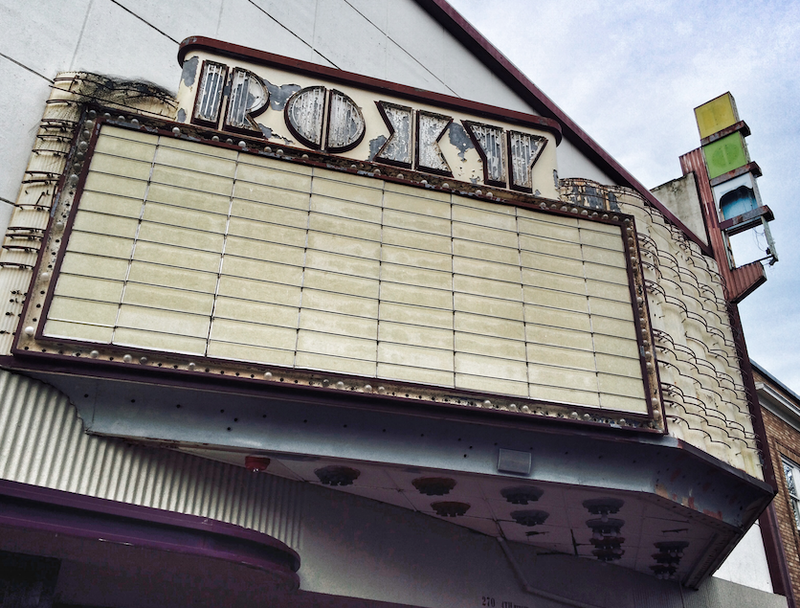 Would love to see the ROXY turn into a boutique movie house. What about contacting Seattle Film Festival to see if they would like to run it or offer consulting. They are doing great things with single movie theaters in Seattle. They could expand there reach by expanding to Bremerton. As someone who has just moved to Bremerton, I was a bit reticent to comment on this, but I’ve seen first-hand successful turnarounds and want to share that experience. By far, the single most effective means of revitalization is to permanently infuse the neighborhood with people via housing…and creating the type of housing that attracts not only residents but visitors…i.e. work/living spaces. For that reason, I’d vote for the “residential oasis” strategy. One community that has adopted this, as well as other strategies is the St. John’s neighborhood in North Portland. I hope that the City Council and other thought-leaders here in Bremerton are researching other communities that have successfully revitalized their historic downtown areas. One last thought…at the foundation of every successful revitalization is its community’s dedication and commitment to make it happen under the leadership of visionary and strategic leadership…I’m too new to know whether or not we have that here in Bremerton but I certainly hope we do! I agree that the “pedestrian mall” concept feels right, but it’s been tried for similar reasons and failed in other parts of the country. Specifically the Santa Monica Mall decided to create a no traffic zone with trees, flowers, live music, etc. Shoppers stayed away in droves. When they reopened the drive through area, people could see the stores, and they started shopping again.